Home » Matthew » Birger Gerhardsson 1926 – 2013. Birger Gerhardsson 1926 – 2013. By way of a note in Facebook (by Gunnar Samuelsson), I become aware of the sad fact that prof. emeritus teol.dr. Birger Gerhardsson died the night between 24 and 25 of December. Birger Gerhardsson was born Sept. 26th, 1926 in Vesterbotten. He was ordained as pastor in 1953, became teol.lic. 1956, teol.dr. in 1961 at Uppsala University, and professor in New Testament exegesis in at Lund University in 1965. He worked here until his retirement. Prof. Gerhardsson was to some extent influenced by Harald Riesenfeld (Uppsala) and his views of the gospel traditions, but developed his own viewpoints much further in his dissertation of 1961 : “Memory and Manuscript; Oral Tradition and Written Transmission in Rabbinic Judaism and Early Christianity.” Thesis, Uppsala., 1961. In his thesis he argued for the need to take advantage of the views of the rabbis on how traditions were formed and transmitted, and applied this to the gospel traditions (cp 1 Cor 15:1ff). His views were further developed in his Tradition and Transmission in Early Christianity, Coniectanea Neotestamentica, 20. Lund,: C.W.K. Gleerup, 1964, and these two works were later republished in one volume by Eerdmans (19 98; see picture above). 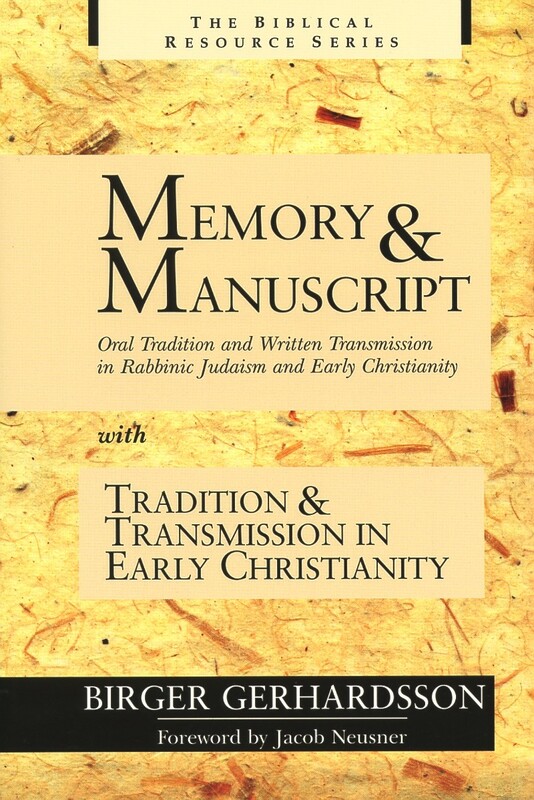 Gerhardsson here argued for the use of memorization by the early Christians, partly influenced by rabbinic methods of learning in the transmission of the Jesus tradition. This thesis came under severe criticism claiming that he was guilty of projecting post-135 CE views on tradition back in to the pre-70 CE period. But Gerhardsson never claimed that the rabbinic methods as a whole could be traced back to before 70 CE, he always distinguished materials about education from the Tannaitic and Amoraic periods. Later scholars as M. Hengel, R. Bauckham and S. Byrskog have built further on some of Gerhardsson’s viewpoints. In order to understand the context and focus of this work of Gerhardsson, the interested readers should read his Preface in the reprint edition of 1998 (pp. ix-xxiii), as well as the Foreword by Jacob Neusner, one of his former critics (pp. xxv-xlvi). Both are very informative. Prof. Gerhardsson also published several studies related to The Gospel of Matthew; e.g., The testing of God’s son. (Matt. 4: 1-11 & par. ): An analysis of an early Christian midrash (1966); The mighty acts of Jesus according to Matthew (1979); The shema in the New Testament: Deut 6:4-5 in significant passages (1996). Several of his studies was also published in Swedish. To the general student of the New Testament Gerhardsson was probably best known for the textbook he edited but did not write, published first in 1969, and in several later reprints (En Bok om Nya Testamentet). In 1996 he was honored by a symposium on Matthew and a Festschrift (Matteus och hans läsare – förr och nu : Matteussymposiet i Lund den 27-28 sept 1996 : en hyllning till professor Birger Gerhardsson som fyllde 70 år den 26 september 1996 / red. : Birger Olsson, Samuel Byrskog och Walter Übelacker (Series: Religio 48, Lund 1996), and in 2009 another volume was published (Werner H. Kelber, Samuel Byrskog, eds, Jesus in memory: traditions in oral and scribal perspectives. Waco, Tex. : Baylor University Press, 2009) that was both a dialogue and to a large extent an appraisal of Gerhardsson’s views. Prof. Gerhardsson was an engaged Christian and a brilliant scholar; he will be missed by many, but his works will still be discussed for years to come. More words of tribute here. By TorreyS in Matthew, New Testament, Paul, Persons on December 29, 2013 .